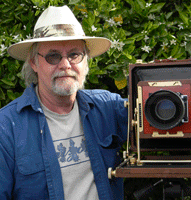 Larry Steber Artist's Statement: Living most of my life in the Northwest (Washington, Oregon, Alaska) it was impossible not to be affected by great landscapes. The desire to be out in them, walking across them, and eventually to photograph them was just a natural progression for me. In my pursuit of the perfect image, I derive as much pleasure from tramping through the oak woods of the Oregon Cascades as I do striking out across the Sonoran Desert of Arizona. If I can bring back a decent photograph for my efforts then I'm happy.